Fast setup. On a smooth grade 1 person assembles the array in less than 20 minutes using a screwdriver. Larger Sensor Area. 1.5m2 (16ft2) weighing plate is over 3X larger than previous SnowScales for higher accuracy. Match Capacity to Your Conditions. Measure up to 300mm (12in) or 600mm (24in) SWE with IP68 sealed precision force sensors. SnowScale Control Unit (SCU). The SCU outputs SDI-12 serial data (SWE, load, raw sensor values and settings) and a single 12bit analog channel. 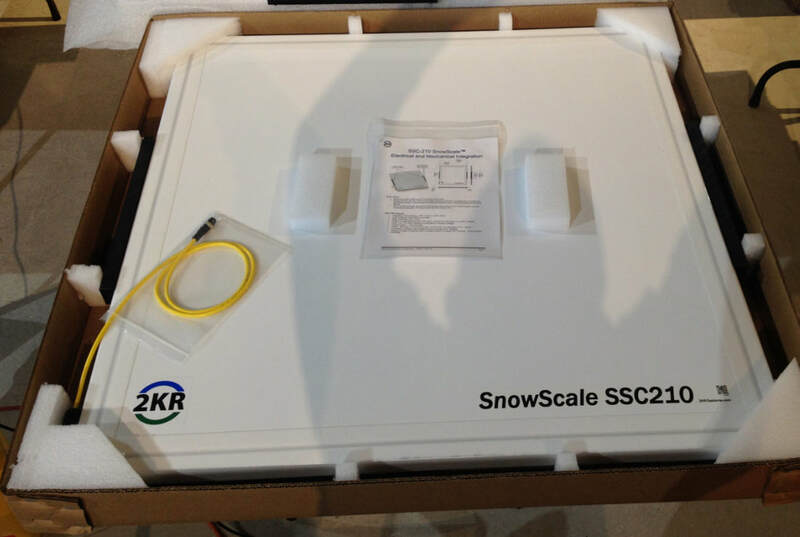 One or more people can rapidly setup the SnowScale and SnowScale Controller (SCU). 1. Prep the site—smooth the grade. 2. Secure the passive panels to central sensor panel using the connection plates. 3. Mount the SCU on a post and connect two cables. 4. Upload code to the data logger and begin collecting data! Displayed is data gathered during the winter of 2016 and 2017 at the 2KR Systems test site in New Hampshire, USA. ​The SnowScale Control Unit (SCU) is a key part of the SnowScale System and is the most efficient way to get infomration flowing quickly from the SnowScale to your data logger. 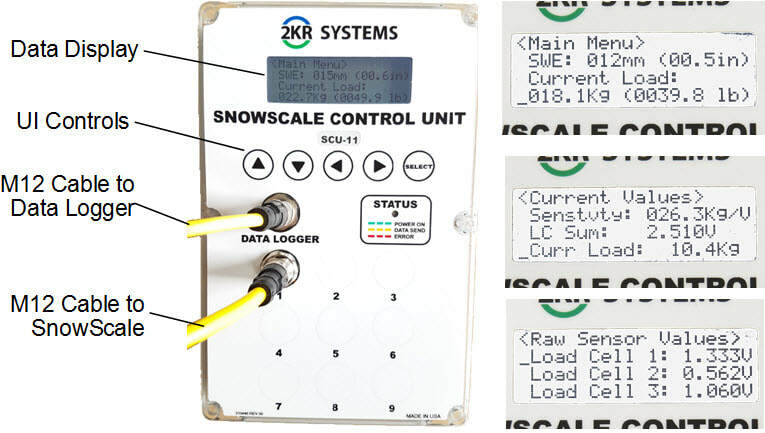 The SCU interrogates the SnowScale, calculates SWE and total load in Kg & lbs then passes the data to the data logger using the popular SDI-12 interface. Tare and sensitivity values are stored in non-volatile memory. The SCU goes to sleep after a sample is taken and can be completely shut off by the data logger between samples. C.S. CR-1000 code is included. 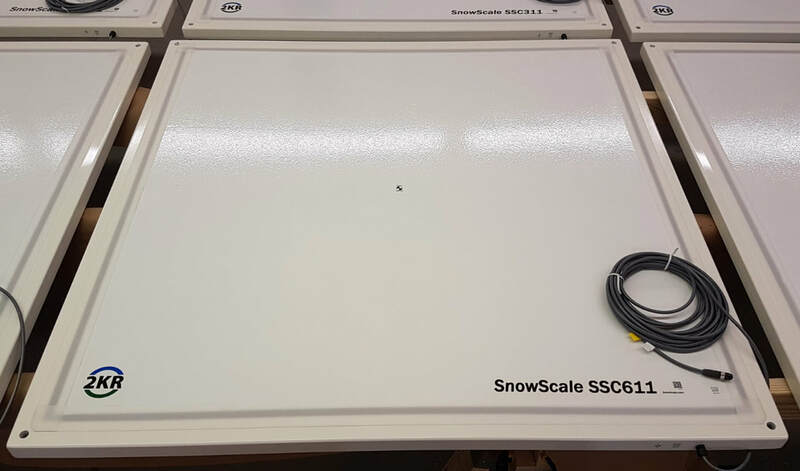 ​The SCU-11 is for single active panel SnowScales such as the SSC-311 and SSC-611 and SCU-22 is for SnowScales configured with up to 4 active panels such as the SSC-1222 and SSC-2422. Power Requirements: 8-30 VDC, 40mA at 12VDC typical. Can be shut off between samples.